A Diamond D-Jet For Sale is currently unavailable to be purchased directly through Diamond Aircraft and it's dealers because Diamond has suspened the development of the D-Jet. The future of the Diamond D-Jet program is unknown at this time. For more about the suspention visit the main Diamond D-Jet page. Diamond Aircraft has not set a time line to when the D-Jet will be certified and be ready for delivery. Diamond D-Jet For Sale pricing was increased 25% to $1.89 million ($1,890,000) in March 2009. In the past, the team has spotted Diamond D-Jet for sale - delivery positions. Currently most of those D-Jet delivery positions for sale have been removed from the market because it is unknown when the Diamond D-Jet will be ready for delivery / program development restarted. 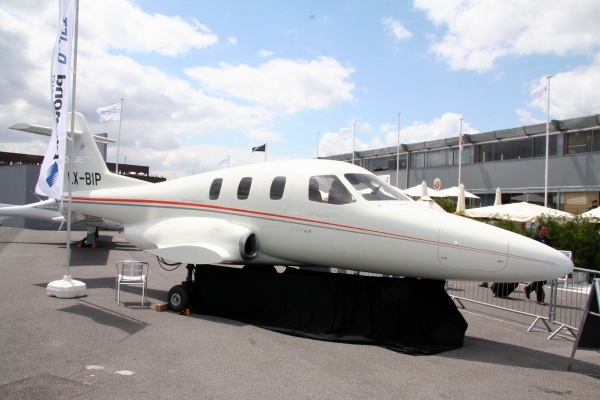 These Diamond D-Jet for sale, delivery positions will likely return to the market once the Diamond Aircraft announces when they expect the D-Jet to be ready for delivery. If you have a Diamond D-Jet position for sale (when the program is restarted) contact our aviation resources team to learn how you can list it here at no cost. Above Diamond D-Jet For Sale page photo by Georges Seguin on Wikimedia Commons. Photo (only) released under a Creative Commons License.